Hi! Our names are Clare and Phil. We were married two years ago, and adoption has always been something we have felt drawn to. We plan on adopting as many children as we can! Clare has a bachelor’s degree in Business and a postgraduate degree in Merchandise Product Development. She works from home for a doctor as an Operations Manager. Phil attended college on a basketball scholarship and then traveled the world playing professional basketball. He earned his master’s degree in Exercise Science and started his own personal training business. Now we own a gym here in Texas, where Phil works as a strength coach for a range of clients from students to professional athletes. We live a healthy, active, all-natural lifestyle and plan to teach our kids about healthy eating and the importance of exercise! We love big families and have lots of nieces and nephews. Clare comes from a large, fun family and loves big family gatherings. They are silly, funny, happy and most of all, loving and caring. A family gathering wouldn’t be complete without music and laughs! Phil’s immediate family lives on the East Coast with most of his extended family in the Midwest, where Phil was born. We love visiting Phil’s family and all of his nieces and nephews, whom we are very close with. We are passionate about our faith and being good stewards of the gifts we have been given. We attend church every Sunday and volunteering in our area. We have traveled internationally with a Christian organization to host basketball camps and spread the gospel. We can’t wait to show our kids how to L-O-V-E one another. 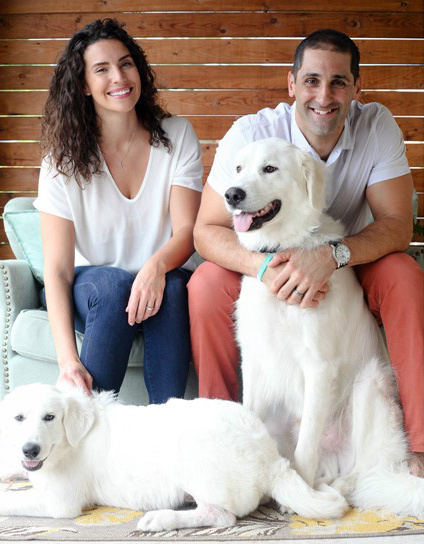 We are also animal lovers and share our home with two Great Pyrenees dogs and three cats. We previously had 10 chickens and plan on getting more someday! We hope you can see the love we have for each other, our families, friends and strangers. We believe that anything can be accomplished when there is love.